Late last year Nintendo released Collectible Badge Centre in Japan, an app / game for the 3DS that allows you to 'win' badges that you can then pin and arrange on your HOME screen. It's rather like an addition to themes, and we shared our impressions at the time; it's now confirmed to be heading to Europe on 13th November, with the new name of Nintendo Badge Arcade. Though free to download, this app makes its money by tempting you to pay for plays of its simple crane game, in which you try and grab the badges you want across various branded sets; you also try and win a theme to match the badges. Each day you get five free tries of a Practice game in which you may be able to win plays in the real thing, but otherwise you need to pay £0.90 / €1.00 for five plays of the crane. We're sure it won't be that cynical, though not all will readily embrace the free-to-play model. Plenty of 3DS owners might, however, and the option to spruce up HOME screens further is certainly tempting. You can see a trailer below, and we'll keep an eye out for a North American release date. Looks fun, fingers crossed I don't get addict to it and spend all my money on trying to get all the badges. Why does anyone want this? Amazing amount of revenue from such a small amount of screen space. Imagine someone trying to do this on a PC. Better late than never. I just hope Reggie thinks the same way. No Nintendo. Please don't do this to me. I beg of you. Is that a White New 3DS XL?! 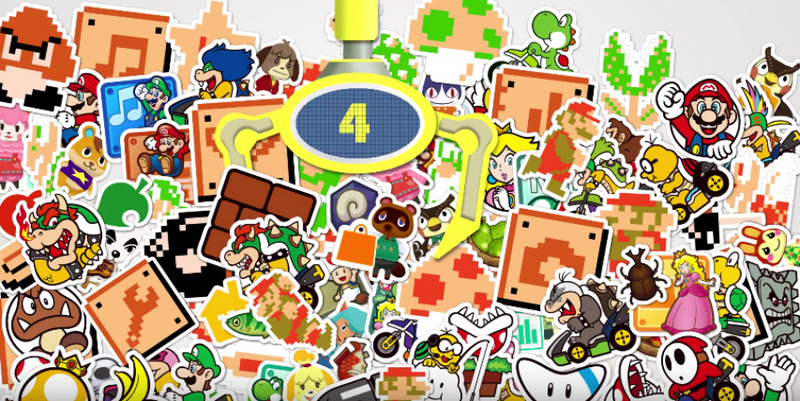 Was this that unannounced 3DS game Nintendo teased was still coming before 2015 ends? I really hope not. It just makes me wonder what crap they've got for the Wii U if this is the case. So this is a good sign for a North America release.. right ? Right ? Please ? I love cute little stuff like this. Been wanting this since it was first announced for Japan. @Oubie Based on the coloured ABXY buttons I would say it is the regular sized white new 3DS. I've spent ~£30 on getting the Pokémon badges in Japan. Over 160 Pokémon badges exist in Japan (http://www.serebii.net/games/badge/). There's over 3,000 badges total so far in Japan. It rotates daily with new panels coming in every week from various Nintendo franchises. @FragRed No. He said that to Japanese investors. This has been out in Japan for a year. So there will be no Nintendo Direct soon I guess, as far as I can see this should be coming out part of the Direct. Indeed, there is your surprise release for 2015, Nintendo fans!!!!!!!! I'd never even heard of this. It looks like a real money sink. I'll be up for doing the free plays each day, but there's no way I'm paying for extra goes on the crane without knowing which stickers if any I'll win. @PHDragoon I mean the one on the right looks like the XL version to me. It doesn't have the coloured buttons like the small 3DS. Watch it again, at the end of the video. @Oubie My Bad. I guess I wasn't paying attention to the systems at the end. That does look like a white new 3DSXL. My guess is that this will be out in NA this coming Friday. Finally! I had my hopes up when a sleuth spotted English text in the Japanese v1.3 update. Maybe now, we'll even see the unused Pink Rabbit costume in Super Mario Maker as well! Will there be a review for this since its an arcade? @aaronsullivan "Why does anyone want this?" Crane games are fun diversions and time wasters. Why anyone would want to pay for it I don't know. Reggie doesn't get into work for another 3 hours everybody, NA will probably hear about it then. One of the downsides of NoA being HQ'd on the west coast. I've always been a huge fan of crane games, been playing a great 1 for free over the years on my tablet when I need to waste a few minutes at the bus stop, that and those push coin things, but it would never cross my mind to pay for something like this. 5 free turns per day sounds about right if you can keep stuff. If it's really just practice and you only get to keep badges you pay for, I can imagine a lot of the free downloads getting deleted in the west soon thereafter. But, it's not out in the west yet so I'll withhold judgement until I can try it for myself. But since they charge $1.99 for themes that I think should be free, well I'm not overly optimistic. Awesome news! And I also spotted the wrestler there from Rhythm Paradise, which probably means we'll also get the Rhythm Paradise badges? WHICH may also mean the 3DS version will be released in the west as well? @Krisi I noticed that too. I have my hopes up for a Summer 2016 release for Rhythm Paradise 3DS, I think all the previous games in the series came to the West too. This North American gamer is definitely jealous! When can we expect to see this badge app??? 'And so the world ends, not with a bang but a whimper'. Release date is Friday 13th not a Thursday like all eshop releases tend to be. No info from NoA yet, maybe the Direct will only be a North American one and Nintendo UK/Europe twitter will announce the details for Europe. Revealing this as part of a Direct could anger people in the same way a lot of E3 did, nothing more than a money grab (though more fair than the real version of these machines). Maybe the Direct isn't even a general one but rather focused on Smash for example. Get some news on Lucas/Ryu/Roy amiibo as well as ballot characters and more stages. If Inklings are a ballot character then maybe add in some Splatoon news as a side announcement (I doubt nothing's happening with Splatoon this holiday). The reason this has a Friday release, is because new badges are released every Friday. I've been playing the Japanese version for months now, up until the v1.3 update which prevented a lot of people from playing, probably because they were planning this EU launch. @Oubie The first one, for the GBA, was a Japan-exclusive. And while I think the DS game was successful around the world, the Wii version didn't sell that much in the west... which may have left a bad taste in their mouths... But I hope not, because I absolutely love the series, and I would be overjoyed if the new one came out here as well. I'll get this if it's possible to get all of the badges with just a lot of free plays and determination. Wow, I never thought this would be localized! Good for those who wanted it. I don't really think I'd use in much, since I basically just use two full screens on my 3DS Home menu, and that's it. Only if they released some badges I really liked (Like, Kirby Air Ride stat patches?!) would I try to win a few. @Krisi Ah okay, didn't know that about the GBA version. Well, I hope for once they don't judge the success of that series on sales numbers. It's not a mainstream blockbusters, more of a niche game for the fans. I hope they don't cost much to develop so the sales wouldn't matter anyway. But 1 euro for five tries... even in the fairest setting is 20 cent each badge, pulling out a cool looking theme only with those will cost more than buying regular themes (and those are not cheap already >.>; ). You can, in my free play of the Japanese version I've collected a lot of the badges I've wanted without paying at all, partially because I couldn't. Get good at the practice round to earn free plays, get some free plays on weekly Friday updates, and occasionally get lucky free plays from blue or red badges in practice. Some of the more desirable badges cannot be grabbed in a single move, but may take 2 or 3 to make it reachable. @k8sMum TS Elliot!!! Love that quote! Thankfully, if you only want to get specific badges you shouldn't need to pay a single penny. @RupeeClock Oh that's awesome, being able to keep the badges from the free plays will motivate me to play this daily. Now all we need is a release date for the US. It's a blast to play daily. To clarify, once per day you can play a practice mode with wooden badges. Every 10 wooden badges is one free play. If you're lucky, one of those wooden badges can be a red badge which gives you three free plays. Sometimes, the last wooden badge will be a blue badge which gives you one free play, usually if your total didn't reach 10 badges. Your total wooden badges carries onto the next day as well. Most days you'll get at least one free play, it's rare that you don't get one. Game & Wario's Chick-n-win with microtransations?I'll download it and use only the free daily try. In the Japanese version there are now hundreds and hundreds of stickers. There are also events sometimes where you get 3-4 free tries. @RupeeClock I'm surprised how generous the free side of this app is especially when most crane games just eat up your money without giving much in return lol. I might never stop playing this daily if we get a lot of new badges throughout the months/year. There's tons of badges, the promo video is representative of the launch selection that Japan had. We'll see tons more like Yoshi's Woolly World, Splatoon, Fire Emblem, Rhythm Heaven, Pokémon, Pushmo, Pikmin, Zelda LBW, Majora's Mask, Triforce Heroes, Super Mario Maker, MK8, and many more. @Iggly Well, if you really want to make most of the free tries you should save them up. Cause usually you'll get 1 to 2 tries per day and that usually won't be enough to clear one screen. You'll want to clear one screen though because if you don't it'll reset when you leave the app and then it will be harder again to get certain badges. I wasn't sure, but do free plays get saved if you don't use them? When I played, my impression was that free plays MUST be used when you earn them, since it prevents you from leaving the arcade machine until you've played. Good point! I mean they have lots of material to put in a Direct, e.g. recent Mario Maker update, and this, maybe there's a Direct next week, however I doubt there will be Direct this week, as they already announced this for a Friday release. Come on Nintendo! I do rather enjoy this on my Japanese system. A good way to kill 5 or 10 minutes each day. Was it just me, or was the icon they used in the trailer a game card? The pink rabbit looked as if it was in the cartridge slot to me... could be a mistake from the trailer, but seems fairly strange. @teamshortcut It looks a bit like that when you have it installed. Don't know why. Do these badges count towards the "300 games/apps at a time" limit imposed on a 3DS system? This reminds me of the 1966 classic, "It's The Great Pumpkin, Charlie Brown." Nintendo of Japan gets an abundance of Virtual Console games yearly. Nintendo of Europe gets Metroid Zero Mission, cool badge app for 3DS plus more goodies. Nintendo of America might as well be Charlie Brown because all we keep gettin' are rocks!! I question this as well. If this were something that could be used with playcoins I understand, but almost $1.99 (USD?) per play? What if you get multiples? Are certain badges rarer than others? This sounds like a horrible money sink, even worse than charging $2USD for themes that should honestly be free (Especially when you consider how pathetic the theme selection is in the US). I think I got the idea the moment I read "Crane Game". And the rabbit looks like the Streetpass bunny's equally evil merchant cousin. @Angelic_Lapras_King No. Well technically it's limited by the amount of spaces the 3DS menu has. But there is a limit of how many badges are accessible through the badge placement function. @Bagels Where do you get $2 per play from lol? That would be ridiculous. You can buy 5 plays for 90 Yen up to 20 plays for 360 Yen ($3). Friggin' finally! This is the first ripoff since the Splatoon HOME Theme that has me excited! This will be loads of fun to play around with! I'll just ''play'' the free attempts and see if I get any icons I like. There's no way I'd throw money into this, but as a free extra I don't mind it at all. Who needs decent games when we've got this sort of stuff to keep us entertained. And it will have the extra advantage of introducing kids to gambling. 5 goes for .90p. So for the price of a boring old Mario game the kids could have about 170 goes to gamble to win more rubbish. Can't wait for the next Nintendo Direct with all the hype. I won't be spending any money on the crane game, but maybe we'll get some nice themes that can't be found on the shop through this? Yeah, they can be fun. And I admit I skimmed right over the free tries part which I don't usually do before commenting (though that video sure makes it seem like it's for practice only). What made me comment was the Twilight Zone nature of people excited about throwing away more money on the backgrounds of a 3DS. On a site where DLC, paying for fully built parts of a game, gets the torches and pitchforks raised. After my comment it went on and on but the dissenters came out and made me feel better. When you can do a search for any one of these characters in google and pick your favorite picture and with a program like Microsoft Paint do the same thing... it's sort of insanity. Maybe in practice it won't be too bad as others are pointing out you can get plenty for free, but it's on top of the already questionable themes that makes me cringe. It's easier for me to scoff, too, because I don't really enjoy using my 3DS. Spending time looking at the awful screen to "enjoy" my expensive themes and badges is pretty low on my list of free time activities. For some it's a treasure and this will appeal much more, of course. Don't spend money on this kids! Maybe NA will get this in the future. Looks like fun! NA appears to have soft launched it, it's on the eShop now. Oh look, it just released in NA. All of a sudden. Yaaay, NA gets equal treatment!! @Barbiegurl777 they did a stealth release of the badge thing on the 3ds eshop. If you go under new releases you can download it. RPGs can be pretty great btw. I'll try to think of a cutesy one you may like. @aaronsullivan I'm just forgttgn this exists an dfocusing on the ND. Well unless it's in the ND, but I hope not. I just rewached the ND from last Nov to try and see what this one might have. Last years was pretty good. Alot of info about amiibo and CAptainToad and Majora's MAsk adn Codename Steam. It was 33 minutes of content, harldy any filler, just NES Remix on 3DS, but not yarn ladies or tours through rock gardens - not my favoitre parts of the E3 show. And there was a demo for Pikmin 3 right after, so maybe XCX does get one. I'll squeal like a little girl, especially since I have to wait for Santa to play mine. So I'm going to try adn stay postive for the next 40 hours or so, And to do that I have to pretend this doesn't exist. The Mario badges looked odd and out of place on my SEGA Genesis/CD background so i removed them. I had a blast with the crane picking them up though! @Zombo 1. I'm glad I don't eat breakfast in your house. 2. Only kids eat cheeros, so I guess you will like the badge collecting. 3. It's sad to see what was once a major games company having to resort to this stuff as well as toys and cards, while their games are taking second best.